Supernatural has such a dedicated and loyal fanbase, that a spin-off seems like a given. However, a former attempt stalled, and so it’s taken several years for the obvious spin-off to emerge. But this year, we’ll see the attempt to give the ladies of the Supernatural universe their own story, as a backdoor pilot emerges in a Supernatural Season 13 episode. 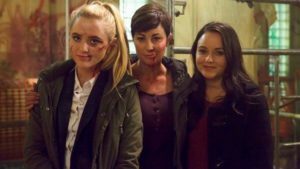 That spin-off will be Wayward Sisters, and it was confirmed at San Diego Comic Con 2017 that the series will center on Jody Mills (Kim Rhodes), and her foster daughters Claire Novak (Kathryn Newton) and Alex Jones (Katherine Ramdeen), and Donna Hanscum (Briana Buckmaster). Added to the family, and bringing the Supernatural element into the home will be Patience Turner (Clark Backo), who will play a new foster daughter of Jody’s who discovers she has psychic abilities. Whether or not the backdoor pilot results in an actual spin-off depends on the response to the episode. With the fandom pushing for more female voices to be heard in the Supernatural universe, one can only hope that the series will be well received. Fans, make sure you watch this one live to show your support! Episode Details and Casting Scoop Revealed at Supernatural’s Rocking Hall H Panel! BURBANK, Calif. (July 23, 2017) — Warner Bros. Television’s long-running, fan-favorite series Supernatural (Thursdays 8/7c The CW) is “carrying on” with the confirmed casting for a potential new Wayward Sisters series, set in the world of Supernatural. Cast and producers at Supernatural’s packed Hall H panel at Comic-Con gave further details about the upcoming episode, including officially announcing the cast. While some faces will be familiar to fans of the Winchesters, there were also a few surprises. Scheduled to air as an episode within Supernatural’s 13th season, Wayward Sisters is written by Andrew Dabb and Robert Berens, who will executive produce along with Robert Singer and Phil Sgriccia. Centered on the character of Sheriff Jody Mills and a group of troubled young women — all orphaned by supernatural tragedy — these “wayward sisters” emerge as a formidable force against the supernatural, under Mills’s training and protection. Leading the group is Sioux Falls Sheriff Jody Mills (Kim Rhodes – Colony, Kings of Con), an associate of Bobby Singer, who has grown to be one of Sam and Dean Winchester’s most trusted friends and allies. A foster mother to Claire Novak, Alex Jones and new character Patience Turner, Jody’s greatest challenge will be to prepare them for the battles ahead. Lending Jody a hand will be series fan-favorite Sheriff Donna Hanscum (Briana Buckmaster – Arrow, Frequency), a relative novice to the hunter’s life, but a close friend who Jody can confide in. Claire Novak (Kathryn Newton – Big Little Lies, Manchester by the Sea) was introduced to the supernatural world when her father became the vessel for the angel Castiel (series star Misha Collins). Now, a gifted hunter, she lives with Jody, but struggles against her rules. Also taken in under Jody’s wing, Alex Jones (Katherine Ramdeen – The Tall Man, Almost Human) was rescued by the Winchesters from a family of vampires who used her as a lure for unsuspecting humans. Traumatized by the violence, she has resolved not to hunt…until a threat emerges in Sioux Falls that threatens her new family. A new member of the Wayward Sisterhood is the character Patience Turner (Clark Backo – Designated Survivor), a high school over-achiever whose life is turned upside down when she discovers she’s a powerful psychic, a gift she inherited from her estranged grandmother (and season one Supernatural character) Missouri Moseley. Hunted by dark forces for her power, Patience finds refuge with Jody and her wayward family. In addition to the Wayward Sisters casting, it was also announced that Lawrence, Kansas psychic Missouri Moseley (played by Loretta Devine – The Carmichael Show), who made a memorable appearance as a Winchester family friend in the season one episode “Home,” will also return to Supernatural this season, in an episode to be announced later. Supernatural returns for its 13th season on Thursday, October 12, in a new time period (8/7c) on The CW. Jared Padalecki and Jensen Ackles star as Sam and Dean Winchester. Misha Collins also stars as the angel Castiel, alongside Mark Pellegrino as Lucifer and Alexander Calvert as his son, Jack. Created by Eric Kripke, the series is executive produced by Andrew Dabb, Robert Singer, Phil Sgriccia, Brad Buckner and Eugenie Ross-Leming. The series is from Kripke Enterprises Inc. in association with Warner Bros. Television.